I feel like if I don't bail on my investment of nearly 5,000 candy corn now I'm going to lose out? Am I being paranoid? There are absolutely tons on the market for 10 copper and I'm not sure the desirability there. I'm praying they jump up after Halloween but I'm quite sceptical. I thought these were good questions and my comment response got a bit long winded so I started drafting up this post. There are a few things I want to look at here. First, will candy corn be desirable after the holidays? Second, will supply decrease? Finally, are there other things worth investing in? Or how much is too much? Let's answer the easiest first - supply will definitely decrease. There will be no more candy corn entering the market. That we know of - and this is an important thing to bear in mind. Arenanet may make them accessible through some forge recipe or something of that nature (I highly doubt this but never rule out possibilities completely). Will candy corn prove to be desirable after Halloween? If supply decreases but there's no demand then it's not that great an investment right? I think candy corn will remain in demand. 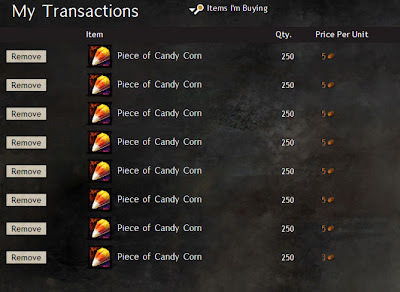 Check out this gw2db list of recipes that require candy corn. You'll lose some of that demand post event. Hard to say how much. But there'll be (as far as we can tell) no more candy corn until next halloween - that's IF arenanet bring the same material back. They more than likely will but if they don't. Boy. I know there are dozens - probably hundreds of folks who've invested in candy corn because they believe it'll be worth something later. Of these investors, only a handful are the most patient. I'm thinking in terms of 4 months or more. That's aeons in MMO time. I have visions of corn going for a silver a piece this far down the line and though it's optimistic, it might not be unrealistic. When you think in this time scale it's very hard to see candy corn as a poor investment. Keeping your money in gold is worse. Inflation - though Arenanet need to counter it to avoid a loss in gem revenue - will still inevitably devalue your in-game money. Even if candy corn proves to be less desirable than predicted. Even if there's close to 1 million corn in investor's pockets now. There's still very little chance you'll be burned by holding onto corn at the current low rates. The nervousness joey2beers feels there is entirely normal when investing - have I made the right call? Am I going to lose out? 5,000 corn at 10 copper is 5 gold. That's not a small amount of money at the moment. But when items are 10 copper and below the very worst you can do is lose 9/10th of that investment. There's a bottom limit there - a cushion. So long as it's not your total funds you'll learn and be smarter and wiser. My advice is to leave a host of orders at half that too - 5 copper. You're even better insulated. Investing is never going to give you a 100% positive return. But if you bail before an investment reaches the period when you've calculated (logically) you'll start seeing good returns then you'll always be sitting on around the same gold total in your pot. Share your own thoughts, I'm looking forward to them! So how many iron ingots does it take to craft Balls of Steel? I'm kidding ! Thank you very much for all of your guidance. You're a wise man my friend ! I plan to invest in Candy Corn before the end. Even though it may take time they will become valuable as supply drops and the fact that some Halloween themed Legendaries require 250+ of them makes me think they will become thought after. Actually the exotics require 1250 cc per weapon, because you also need 20 superior sigils of the night for it. Okay... with the release of ACT 2, it's extremely easy to get the candy corn right now. In the lab, if you go along with the zerg, you'll get massive amount of candy corns. That being said, atm candy corn is on the drop right now. 8c each. 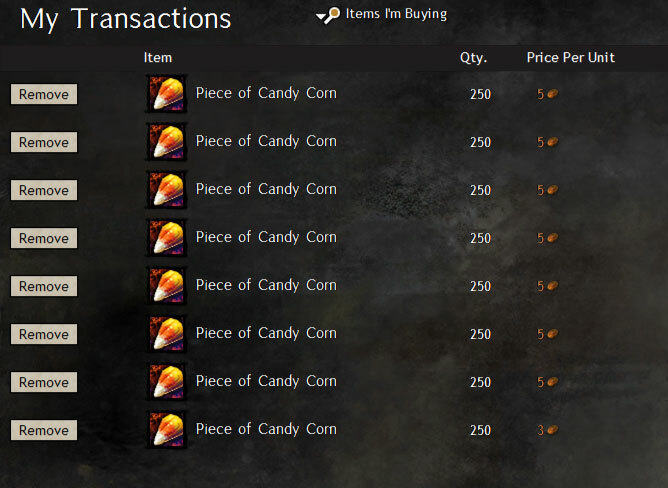 As the final week progress I only see more candy corns in the market therefore we should be able to get them at dirt cheap... almost like what BLC was in the past. However that being said, I don't know how long into the future will the supply decrease... it is a bet that's questionable in my opinion. However I prefer storing and hoarding the crafting materials needed, like the skulls, centers, and fangs, they're not dropping as often and you need 100 of them for the halloween legendaries so they're worth investing/farming for in my opinion. I'm picking up some buy orders for 5 copper now. Setting up a load at 3 copper - they may reach that. At 3 copper it's an investment that is almost impossible to lose with. I concur with the anon above too - fangs and skulls and nougat are another good investment. Right now the amount of buy orders at 5c are so numerous that I wonder if they will actually drop down below that before it starts rising again. There aren't that many days left now after all. I took the slightly riskier route and ordered a bunch at 5c. If you're concerned about losing a lot of inventory space for a few months, try Trick-or-Treat bags instead of buying hundreds stacks of candy corn. Presently the bags are valued 3.5 times candy corn. i dont know i it has already been mentioned, but nougat and skulls are worth 37c at the vendor, and you can get them for 38c. so no matter how the price will develop, you really cant lose more than one c per item. I know I'm getting ahead of myself a bit here but, with thanksgiving and Christmas around the corner, yams, mint leaves, beets, eggs, and sugar pumpkins could be on the rise in the coming months. Definitely - and we can follow the example set by price trends from this event. Certain items (whatever is popularised on reddit or other trade forums) will spike the week before the event hits - if you've stockpiled, selling at this peak might work nicely. Pumpkins and ghost peppers didn't reach the peaks they hit before the event started once things got going. You know what else might be popular, the snow truffles. I think it might have something to do with the Christmas event... hopefully. I agree mats will be rarer but I still think Candy Corn will prove popular. Some of these recipes will admittedly be limited by other items' rarity (omnomberry ghosts for instance) but the karma bought items (with basic cooking items and glaze) are almost as good (26% MF for instance) as the best. Just made an investment of 2500 candy corn. Should I get more or invest in mats? I invested in 2000 (at 5c a piece! ), and my biggest fear is that I didn't get enough. I may spring for some more, but personally I'm keeping it simple and just going for Candy Corn. Just by the by they disabled vendoring for halloween mats a patch or 3 ago, so your limited to using them or selling them on the TP now. Just (to test) sold 1 platic fang for 37 copper - worked fine. They may of course change this later but I doubt it. Can't think of a reason why.